Several people have asked why Tony is shopping on Black Friday, to which I reply: one does not become a billionaire by paying full price for wafflemakers. I WANT PIE! <~~~~~ my new favorite emoticon so cute! LOL xDD This is awesome! "One does not become a billionaire by paying full price for wafflemakers." It feels fairly realistic and reasonable, if they do all live in Stark Tower and have developed friendships. Suppose Tony needed some help redecorating and had a bunch of heavy furniture to move around? 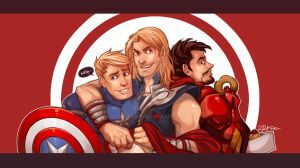 He simply asks his friends Steve and Thor to do a bunch of heavy lifting in return for pizza and beer. Perhaps Pepper has a flat and is missing a jack to swap out the tire; not much of a problem for our dear gamma-powered friend to lift up the end of the car for someone to change the tire without even needing to kneel down. I like the alternate universe you imagine. It is similar in some ways how I like to imagine other super-powered teams act and get along with one another once the costume comes off and everyone needs to unwind a little. Thanks for sharing and I hope dear hulk gets to enjoy some pie soon. WELL THOSE WAFFLEMAKERS AIN'T GONNA BUY THEMSELVES AT SALE PRICE! XD I think this was my grandmother...How ever did you capture her so well? Nice job. Made my day. Haha, was she Hulk or the instigators? My grandmother always woke us up so early on Black Fridays, she was definitely a Tony Stark here.